We had friends over for dinner on Friday and through a communication mix up I ended up with several extra kilos of taro. This is not a problem since I love taro but I do get tired of eating it just plain all the time so decided to experiment with this recipe. Taro is a Polynesian staple. It's a root that tastes a little like a potato but is much denser and lacks that slightly acidic vitamin C flavor. Usually it's peeled, sliced and boiled in water with a pinch of sugar and salt added. When perfectly cooked it's firm on the inside and slightly sweet and gooey on the outside. 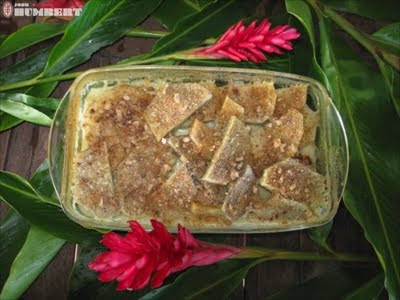 This recipe is inspired from a Chammoro recipe from the Marianas Islands that I found on www.chammoro.com. I've tweaked it to work with what I usually have in my kitchen and changed around a few quantities. It smelled great when it was cooking and tasted even better. The butter makes it rich, the coconut milk makes it sweet, the onions and garlic give it a mouthwatering aroma and even better flavor and the taro on the bottom of the dish got deliciously chewy. A perfect Polynesian side dish especially for grilled fish. This makes four to six servings. 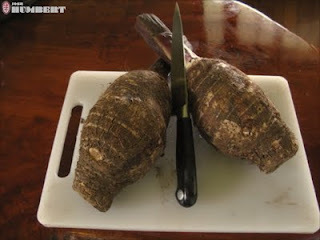 Peel and cut the taro then set it aside to soak in a pot of cold water. Melt the butter on medium heat in a large frying pan then add the chopped onions and shallots till they are transparent. Add the garlic and cook for about a minute. Add the flour and stir till the onion mixture is coated and then for about one more minute. Add the coconut milk and water in four parts, stirring the mixture so that it thickens without getting lumpy. Cook till thickened, about seven-minutes, add salt, pepper and optional cayenne pepper to taste. Drain the water from the taro then pour on the sauce, stirring so that the taro is completely coated. Pour into a casserole, cover with aluminum foil and cook on 350 F for 40 minutes. Remove from the oven, take off the aluminum foil and sprinkle the top with bread crumbs. Return to the oven for another five minutes till the breadcrumbs are crisp and golden. Sounds fabulous. I'm going to see if I can find taro in Switzerland. Not sure...but then again I've never looked! Good luck! You could try it with potatoes or turnips maybe if you can't find taro? I'm curious to know if anything else besides taro works for this recipe so I can add it as an alternative for non-tropical living folks.